This comprehensive treatment combines Vitamin C blend with hydroxy acids, plant derived stem cells, and deeply hydrating ingredients that fight free radicals which damage skin. Our results-driven treatment will change the Image of your skin in just one session. Vitamin C, alpha and beta hydroxy acids, and gentle yet effective enzymes speed up cellular turnover lightening, tightening and brightening all skin types, even Rosacea and sensitive skin. Our luminous facial is designed to cleanse your skin according to your personal needs, leaving you with a smooth, rejuvenated and glowing complexion. Our anti-aging facial uses a combination of natural essential oils specifically formulated for maturing skin. This treatment will restore moisture to the dermis to fill in fine lines creating a smooth and revitalized skin tone. Goji berries are loaded with antioxidants that do wonders for your skin and body, including zinc, calcium, iron, selenium, phosphorus, and germanium. Due to the large amount of antioxidants found in this fruit, Goji berries are able to slow down the aging process of the skin to keep the skin looking younger longer. To help bring back that healthy glow, your skin is deeply re-hydrated with rich vitamins that repair stressed skin, leaving your complexion quenched and radiant. This purifying facial with the ylang-ylang flower helps to reduce excess sebum and impurities. This treatment includes deep pore cleansing, high frequency and extractions to better cleanse the skin and avoid future breakouts. Our purifying back facial helps clear up clogged pores by using ylang-ylang ingredients to help stop inflammations and breakouts. Our facial peel procedure smoothes and softens the skin by exfoliation. This treatment will help diminish fine lines, decrease acne outbreaks and assist in healing the skin. This luxurious eye treatment rejuvenates the tender skin under the eyes to rid puffiness and fine lines. 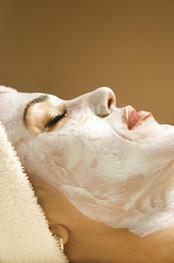 ​The Epicuren Facial works wonders on all skin types. While increasing detoxification, the appearance of the skin's clarity, elasticity, texture and overall health improves. Epicuren enzyme protein complex, referred to as the Metadermabolic Enzyme, is the heart of the Epicuren line. This enzyme is a protein that is combined with a waterborne solution of B Vitamins to create a protein with intelligence. The Metadermabolic Enzyme encourages the skin to self- rejuvenate, similarly to how aerobic exercise supports your metabolism. Your largest organ, the skin, is replenished while receiving antioxidants and moisture, naturally resulting in a more youthful, vibrant appearing skin. The SCIENCE behind the Enzyme that replenishes!